KVPY Registration 2018: KVPY is an acronym for Kishore Vaigyanik Protsahan Yojana.KVPY Registration and application form filling start from the 11th July 2018. The sole aim of conducting the KVPY Exam is to provide generous fellowship & contingency grant to the selected KVPY fellows up to the pre-Ph.D level or 5 years. KVPY is a national level scholarship programme conducted by Indian Institute of Science (IISC), Bangalore. This programme is started by the Department of Science and Technology (DST), Government of India. Read this article to get complete details about KVPY Application Form 2018. 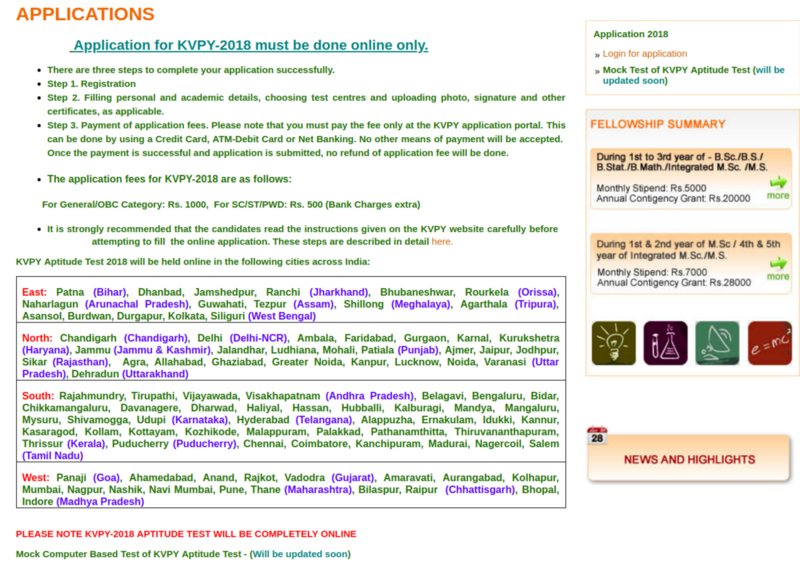 KVPY 2018 Application Form start from the 11th July 2018. Kishore Viagyanik Protsahan Yojna is a national level fellowship programme conducted by the IISc. Students can apply for the KVPY Entrance exam through online mode only. The registration details are given below. Date of the important events is provided in the table below. Applicants must read the eligibility criteria before registering for KVPY 2018. At the time of filling up the kvpy 2018 application form, candidates need to keep the scanned images (photograph, signature & scanned copy of caste/medical certificate (only for PwD) ready in hand. Upload scanned a photograph, signature and other certificates as applicable. (The size of the photograph & signature should not be more than 80KB in JPEG/JPG format). The www.railwayrecruitmentgov.in is the perfect place for those candidates who are aspiring to get recruited in the Railway Jobs. The website provides latest updates and notifications about RRBs, its admit cards, results and the Railway Recruitment Cell. For constant updates follow and subscribe the page.